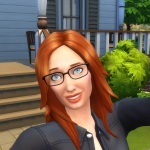 Anyone retired a sim that was married? What happens to the spouse? Just wondering because the husband wasn't one of my own sims and I don't think he was another players sim either. Could be interesting. Yes, I just did. He is still in the family portrait, and still hangs around the house. His wife still has the same relationship status with him, and can start the same romantic events as before. His kids can interact with him too. Only difference is that he has grey hair and I can't control him directly. But when you say he's not your own Sim, do you mean he doesn't live in your house? I'm a little confused about what you mean. Oh ok, I follow now. I don't think it makes a difference whether you created a sim or they were originally an NPC. Just be aware though, I found out today that retired sims only get to live a few days before they're forced to "move out" (essentially, be killed off). So the sim I mentioned has now been removed from my game and his wife is a widow! That's awful, your poor widowed sim. I was going to retire one of my Sims today to make one of the others playable as it's going to take me a while to save up the sim cash to unlock the fourth sim slot. Think I may wait a while now. I just hate the way they set up the simcash thing. I dont know how many times I accidentally press using the simcash. I had about 140+ simcash & was saving it up to get a 3rd sim. Lo & behold I am now back to 120. Dont remember what I just use the 20+ simcash for. I wish they put a put something like "Do you really want to spend your simcash?" It's so hard getting the simcash. In the first few days I accidentally spent 50 simcash on a necklace. It's a very pretty necklace but I if I had been paying attention I wouldn't have purchased it. I was only looking at the numbers not the simoleon/simcash part, doh. Right now I'm wondering if any of the bathtubs cost simoleons. The only one I have unlocked at the moment costs 150 simcash. I would like another item that can recharge my sims' energy but not at 150 simcash. Especially now that I know the 4th sim costs 515 simcash. Oh, well, I'll keep grinding away and get there eventually. I've been playing this for a couple of weeks now and it's alright but feels somewhat boring and repetitive. There's only so much I can do with just two Sims, anyway. In some ways I feel like it makes more sense than Freeplay (individual actions don't take forever to complete, for instance) and there's less of a grinding element to it. There are some weird elements, like the idea that things break down in your house all the time - how is that realistic? My couch is about 30 years old, it doesn't break down every two days. There are some weird elements, like the idea that things break down in your house all the time - how is that realistic? My couch is about 30 years old, it doesn't break down every two days. It's more or less the same mechanic in the Sims 4, it seems to be something EA is fond of. I see, I never did play Sims 4! Still, it's weird.